Mr. Chris Garza presenting for the first time in a conference! Dr. Carolina Tallon, Mr. Chris Garza and Mr. Stefan Povolny attended the 43rd International Conference and Expo on Advanced Ceramics and Composites (ICACC 2019), in Daytona Beach (Florida). - (Invited Talk) C. Tallon, “Processing Enabling Microstructure Control and Manufacturing of Bio-inspired Ceramics"
- C. Garza and C. Tallon, "Hot Isostatic Pressing of Zirconium Diboride for Advanced Manufacturing of Near-Net-Shaped UHTCs components"
​- S. Povolny, G. Seidel and C. Tallon, “Understanding and predicting the thermomechanical behavior of multiscale porous UHTCs via microstructure-properties using Material Point Method"
- D. Pinnisi, K. Gjata, N. Craft, K. Mueller, J. Slagle, L. Backman, E. Opila and C. Tallon, “Oxidation Behavior of Ultra-High Temperature Ceramics Fabricated by Colloidal Processing Routes". December 2018. Mr.David Hicks obtains his Master of Science in MSE. Mr. David Hicks obtained his Master of Science in Materials Science and Engineering. On 11th December 2018, David defended his M.S. Thesis entitled "​Aligned Continuous Cylindrical Pores Derived from Electrospun Polymer Fibers in Titanium Diboride". November 2018. Mr. Nizad Zahed obtains his Master of Science in MSE. Mr. Nizar Zahed obtained his Master of Science in Materials Science and Engineering. On 26th November 2018, Nizar defended his M.S. Thesis entitled "Formation of Meso-Structured Multi-Scale Porous Titanium Dioxide by Combined Soft-Templating, Freeze-Casting and Hard-Templating Using Cellulose Nanocrystals". Kaitlyn Shirey has been selected as one of the prestigious ICTAS Doctoral Scholars. The ICTAS (Institute for Critical Technology and Applied Sciences) Doctoral Scholars Program honors exceptional Ph.D. candidates interested in interdisciplinary research with a competitive graduate fellowship. This scholarship offers full graduate tuition support, competitive stipend and associated benefits for the period of Ph.D. pursuit to a maximum of four years, partial travel support for professional development and external presentations and experience in interdisciplinary research and opportunities for cross-pollination. diboride", Int. J. Appl. Ceram. Technol. 2018; 00: 1–12. 2) E.J. Foster, N. Zahed and C. Tallon, "The Transformative and Versatile Role of Cellulose Nanomaterials in Templating and Shaping Multi-Scale Mesostructured Ceramics", Small 2018, 1802068. August 2018. Welcome new group members!!! ​Our group is welcoming Juan Shiraishi, Julia Goyer, Adrian Davila and Kaitlyn Shirey as our new graduate students. We are also welcoming Allison Slominski, who will be undertaking their undergraduate research in our group this Fall Semester. Dr. Carolina Tallon attended the 7th International Conference on Ceramics (ICC7) in Foz do Iguacu (Brazil). 1) "The power of colloidal processing for bio-inspired ceramics: from particle-particle interaction to manufacturing"
2) "Multi-Scale Porous UHTCs: Dual Approach to Passive Cooling Components Design and Manufacturing"
4-10 June 2018. Carolina Tallon attended the CIMTEC Conference in Perugia (Italy). Dr. Carolina Tallon attended the CIMTEC 2018-14th International Ceramic Congress in Perugia (Italy). ​ She gave an Invited Presentation entitled "Developing cost-effective manufacturing methods and processing strategies for UHTCs". May 2018. Welcome new group members for Summer 2018. Mr. Matt Rotondi, Mr. Nick Green, Mr. Patrick Miele and Ms. Kylie DeClue will be undertaking undergraduate resarch with out group this summer. May 2018. Congratulations to our new graduates Kelsey and Jacob. Kelsey Niehoff and Jacob Slagle completed their degrees in Chemical Engineering and Mechanical Engineering, respectively. Kelsey (co-advised by Dr. Bortner (CHE) and Dr. Tallon) and Jacob have been part of our research group since Fall 2016 and their work has greatly contributed to launch our lab and our current projects. We wish them the best of luck for their next stages in their professional careers! Julia Goyer is one of the recipients of the prestigious Virginia Space Grant Consortium (VSGC) Undergraduate STEM Research Scholarship for the 2018-2019 academic year. The VSGC Undergraduate STEM Research Scholarship Program provides scholarships to rising juniors and seniors in STEM fields who have a specific faculty-mentored research project that has NASA or aerospace relevance. Julia, advised by Dr. Tallon, is studying how interparticle forces and colloidal chemistry mechanisms for ultra-high-temperature ceramics can be used to enable new near-net-shaping manufacturing approaches for aerospace components. Her research aligns with NASA's Space Technology mission directorate through applications such as re-entry and hypersonic vehicles. April 2018. Senior Design Teams in the MSE Senior Design Final. Our two Senior Design Teams were part of the final 8 teams selected to compete for the 2017 MSE Best Senior Design Award on 27th April 2018. - Nuclear Team: Zachary Schiemann, Bryan Hendry, Sam Hertz and Trevor Cassiday, co-advised by Dr. Carolina Tallon and Dr. Celine Hin, Project: "Attraction of Inert Gases to Mesoporous Silica Microspheres in ODS Fe Alloy"
- Cool Team: Thomas Maulbeck, Merve Rath and Garrett Houghton ; Project: "Freezing Maps for Freeze Casting of Advanced Ceramics"
Jacob Slagle attended the XL Undergraduate Conference at Virginia Tech on 13th April 2018 where he presented his work in oxidation testing of colloidally-processed UHTCs. This work is part of a collaborative project with Prof. Beth Opila and Ms. Kendall Mueller (MSE Department of University of Virginia), funded by 4VA. April 2018. Kelsey Niehoff attends the VSGC Conference. Kelsey Niehoff attended the Virginia Space Grant Consortium on 11th April 2018 in Old Dominion University. 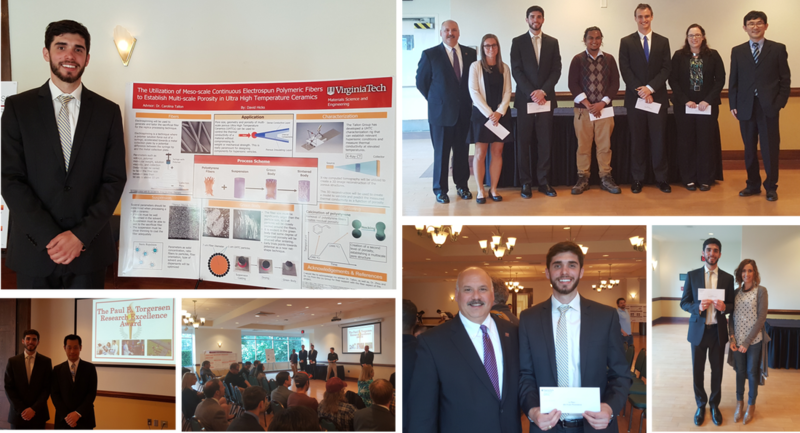 Kelsey, was one of the recipients of the recipients of the prestigious Virginia Space Grant Consortium (VSGC) Undergraduate STEM Research Scholarship for the 2017-2018 academic year. ​Kelsey, advised by Dr. Carolina Tallon (MSE) and Dr. Michael Bortner (ChE) presented her work on developing porous ultra high temperature ceramics with nanomaterial reinforcements for improved mechanical and thermal properties. And during the conference she had the opportunity to explain her research project to President Tim Sands (President of Virginia Tech)! April 2018. Peter Kacmareck attended the Meeting of the Minds Conference. Peter Kaczmarek was selected by the Office of Undergraduate Research at Virginia Tech to attend and present his undergraduate research project in the Atlantic Coast Conference Meeting of the Minds (ACCMOM)), on 6-8 April 2018, in Boston College, Chestnut Hill, Massachusetts. His research focuses on developing functionally graded porosity using ice templating in UHTCs. February 2018. Nizar Zahed and David Hicks received Dr. Gary S. Clevinger, Sr. Memorial Endowed Scholarship. Mr. Nizar Zahed and Mr. David Hicks were two of the recipients of the Dr. Gary S. Clevinger, Sr. Memorial Endowed Scholarship for 2018. Nizar and David are finishing their M.S. in our group in June and July 2018, respectively. January 2018. Attendance to the ICACC conference in Daytona Beach. Dr. Carolina Tallon, Mr. Nizar Zahed and Mr. David Hicks attended the 42nd International Conference and Expo on Advanced Ceramics and Composites (ICACC 2018), in Daytona Beach (Florida). ​ 1) N. Zahed, E.J. Foster and C. Tallon, Controllable Morphology of Multi-Scale Porous Titanium Dioxide. 2) D. Hicks, Z. Zhou, G. Liu and C. Tallon, Aligned Continuous Cylindrical Pores Derived from Electrospun Polymer Fibers in Titanium Diboride. 3) C. Tallon, S. Leo and G.V. Franks, New Avenues for Near-Net-Shaping of UHTCs. January 2018. Welcome New Group Members! It is our absolute pleasure to welcome Whittemore Professor Emeritus of Engineering D.P.H. Hasselman, as an honorary member of our group. We are also welcoming Mr. Tyler Seguine and Mr. Jared Cohen, who will be undertaking their undergraduate research in our group this Spring Semester. We just finished another great semester for research in our group and handed out our first Tallon Research Group Semester Awards. ​- Julia Goyer: Best undergraduate oral presentation. - Jacob Slagle and Peter Kazmareck: Most frequent winners of the Key Outcome of the Week. - Nizar Zahed, Winner of the End of the Semester Research Questions Contest. September 2017. Carolina Tallon attended the UHTC-IV Conference in UK. Dr. Carolina Tallon attended the conference Ultra-High Temperature Ceramics: Materials for Extreme Environment Applications IV, in Windsor (UK). She was one of the members of the organizing committee for this conference. ​She gave a presentation entitled Enabling the next generation of near-net-shaping techniques for UHTCs. August 2017. Welcome New Group Members! We are ready for another great semester in research! of UHTCs made by Near-Net-Shaping Manufacturing Processes. We are also welcoming Julia, Helen and Peter, who will be undertaking their undergraduate research in our group this Fall Semester. July 2017. Carolina Tallon attended ECerS Conference in Budapest. Dr. Carolina Tallon gave an Invited Presentation in the High Temperature Processes and Advanced Sintering Session of the 15th Conference and Exhibition of the European Ceramic Society, in Budapest (Hungary). ​The Invited Presentation focused on Densification Strategies for Ultra High Temperature Ceramics Prepared by Near-Net-Shaping Techniques. June 2017. Welcoming our new group members. Mr. Kevin Gjata and Ms. Lauren Wade will be undertaking undergraduate research with our group this summer. Welcome! 13th May 2017. Nizar Zahed named Oustanding Senior for the Department of Materials Science and Engineering for 2017. Nizar Zahed was named the Outstanding Senior for the Department of Materials Science and Engienering for 2017. Nizar models exemplary skills in leadership and service. Nizar is working on his M.S. under the supervision of Dr. Carolina and Tallon and Dr. Johan Foster (MSE) developing mesostructured titania using polymeric materials as templates. He will be completing his M.S. in May 2018. David Hicks won the First Place of the prestigious Paul E. Torgersen Research Excellence Award in the category M.S. Poster Presentation for his M.S. project entitled Meso-scale Continuous Electrospun Polymeric Fibers to establish multi-scale porosity in UHTCs. The competition night included 11 finalists poster presentations and 6 finalists oral presentations from M.S. and PhD students across the whole College of Engineering. These finalists were selected from more than 70 applications received. David is in his first year of M.S, and he will be completing his M.S. in May 2018. Nizar Zahed's team also made it to the final 8, with his Senior Design team working in PZT composites for energy harvesting shoe-wear applications. 16th February 2017: Cover and Feature article in the Journal of the American Ceramic Feb issue. by G. V. Franks, C. Tallon, A.R. Studart, M. L. Sesso and S. Leo. Cover of the February issue designed by C. Tallon. 1st February 2017: Nizar made proof of concept!! Nizar Zahed has completed the proof of concept for his M.S. project, under the supervision of Dr. Carolina and Tallon and Dr. Johan Foster (MSE). He has developed multi-scaled and macro-structured porous Titania using polymeric materials as templates! Stay tuned for his paper!! Nizar has been working in this project for a year and he will be completing his M.S. in May 2018. 18th January 2017: Welcome Xueting! Xueting is an xchange student from Tianjin University. She will be working with us this semester doing her Senior Design Project.